QTY 4 VMAX V6-225: 6.2kWh 24V AGM Solar Battery Bank for Home, RV, or Industrial (4) 6V 225Ah AGM Deep Cycle Batteries 6 Volt Maintenance Free by VMAXTANKS at Blog Free Here. MPN: V6-225-4. Hurry! Limited time offer. Offer valid only while supplies last. QTY 4 6 Volt 225Ah AGM Solar deep cycle batteries by VMAX USA. Vmaxtanks specializes in the manufacturing of high quality AGM deep cycle batteries. QTY 4 6 Volt 225Ah AGM Solar deep cycle batteries by VMAX USA. 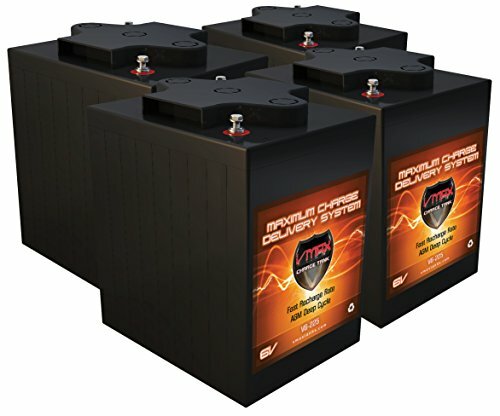 Vmaxtanks specializes in the manufacturing of high quality AGM deep cycle batteries. These batteries offer superior performance and 8-10 years life span in float mode. Please visit FAQ tab at the vmaxtanks website for service, charging and storage instructions. A battery calculator is also available to calculate number of batteries needed for your specific AC or DC power requirements. VMAX batteries come with VMAX labels and a VMAX hot stamp on top of battery. Warranty: 12 Months. bargainshore. is a VMAX Authorized Distributor. High performance VMAX AGM batteries are sealed, maintenance free and safe for indoor use. VMAX batteries are heavy duty and feature military grade plates for an extra margin of performance and service life in either float or cyclic applications, even after repeated discharges.